This paper presents ant manners and the collective intelligence for electrical network. Solutions for Optimal Power Flow (OPF) problem of a power system deliberate via an ant colony optimization metaheuristic method. The objective is to minimize the total fuel cost of thermal generating units and also conserve an acceptable system performance in terms of limits on generator real and reactive power outputs, bus voltages, shunt capacitors/reactors, transformers tap-setting and power flow of transmission lines. Simulation results on the IEEE 30-bus electrical network show that the ant colony optimization method converges quickly to the global optimum. H. W. Dommel, W. F. Tinney, "Optimal Power Flow Solutions", IEEE Transactions on Power Apparatus and Systems, vol. PAS-87, No. 10, pp. 1866-1876, 1968. T. Bouktir, M. Belkacemi, K. Zehar, "Optimal power flow using modified gradient method", Proceedings ICEL'2000, U.S.T. Oran, Algeria, pp. 436-442, 2000. R. Fletcher, Practical Methods of Optimization, John Willey & Sons, 1986. M. Dorigo, "Optimization, learning, and natural algorithms", Ph.D. Dissertation (in Italian), Dipartimento di Elettronica, Politecnico di Milano, Italy, 1992. M. Dorigo, G. Di Caro, "The ant colony optimization metaheuristic, New Ideas in Optimization, McGraw-Hill, pp. 11-32, 1997. M. Dorigo, G. Di Caro, L. M. Gambardella, "Ant algorithms for discrete optimization", Artificial Life, Vol.5, No.2, pp. 137-172, 1999. M. Dorigo, V. Maniezzo, A. Colorni, "Ant System, optimization by a colony of cooperating agents", IEEE Trans. System Man. and Cybernetics, Part B: Cybernetics, Vol. 26, No. 1, pp. 29-41, 1996. M. Dorigo, L. M. Gambardella, "Ant colonies for the traveling salesman problem", BioSystems, Vol. 43, pp. 73-81, 1997. M. Dorigo, L. M. Gambardella, "Ant colony System: a cooperative learning approach to the traveling salesman problem", IEEE Transactions on Evolutionary Computation, Vol. l, No. 1, pp. 53-66, 1997. V. Maniezzo, A. Colorni, "The ant System applied to the quadratic assignment problem", IEEE Trans. Knowledge and Data Engineering, Vol.11, No.5, pp. 769-778, 1999. T. Stuetzle, M. Dorigo, "ACO algorithms for the quadratic assignment problem", New Ideas in Optimization, McGraw-Hill, 1999. B. Bullnheimer, R. F. Haiti, C. Strauss, "Applying the ant System to the vehicle routing problem", MetaHeuristics: Advances and Trend in Local Search Paradigms for Optimization, Kluwer, pp. 285-296, 1999. B. Bullnheimer, R. F. Haiti, C. Strauss, "An improved ant System algorithm for the vehicle routing problem", Ann. Oper. Res., Vol. 89, pp. 319-328, 1999. L. M. Gambardella, E. Taillard, G. Agazzi, "MACS-VRPTW a multiple ant colony System for vehicle routing problems with time Windows", New Ideas in Optimization, McGraw-Hill, pp. 63-76, 1999. G. Di Caro, M. Dorigo," Ant colonies for adaptive routing in packet-switched communication networks", Proc. 5th Int. Conf. Parallel Problem Solving From Nature, Amsterdam, The Netherlands, pp. 673-682, 1998. D. Costa, A. Hertz, "Ants can color graphs", J. Oper. Res. Soc., Vol. 48, pp. 295-305, 1997. L. Schoofs, B. Naudts, "Ant colonies are good at solving constraint satisfaction problems", Proc. 2000 Congress on Evolutionary Computation, San Diego, CA, 2000, pp. 1190-1195, 2000. I. A. Wagner, A. M. Bruckstein, "Hamiltonian(t)-an ant inspired heuristic for recognizing Hamiltonian graphs", Proc. 1999 Congress on Evolutionary Computation, Washington, D.C., pp. 1465-1469, 1999. A. Bauer, B. Bullnheimer, R. F. Hartl, C. Strauss, "Minimizing total tardiness on a single machine using ant colony optimization", Central Eur. J. Oper. Res., Vol. 8, No. 2, pp. 125-141, 2000. A. Colorni, M. Dorigo, V. Maniezzo, M. Trubian, "Ant system for job-shop scheduling", Belgian J. Oper. Res., Statist. Comp. Sci. (JORBEL), Vol. 34, No. 1, pp. 39-53, 1994. M. Den Besteb, T. Stützle, M. Dorigo, "Ant colony optimization for the total weighted tardiness problem", Proc. 6th Int. Conf. Parallel Problem Solving from Nature, Berlin, pp. 611-620, 2000. D. Merkle, M. Middendorf, "An ant algorithm with a new pheromone evaluation rule for total tardiness problems", Proceedings of the EvoWorkshops 2000, Berlin, Germany: Springer-Verlag, Vol. 1803 Lecture Notes in Computer Science, pp. 287-296, 2000. A. J. Wood, B.F. Wollenberg, "Power Generation, Operation and Control", 2nd Edition, John Wiley, 1996. V. Del Toro, "Electric Power Systems", Vol. 2, Prentice Hall, Englewood Cliffs, New Jersey, USA, 1992. G. W. Stagg, A. H. El Abiad, "Computer methods in power systems analysis", McGraw Hill International Book Company, 1968. S. Kumar, R. Billinton, "Low bus voltage and ill-conditioned network situation in a composite system adequacy evaluation", IEEE Transactions on Power Systems, Vol. PWRS-2, No. 3, 1987. D.S. 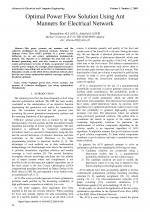 Johnson, L.A. McGeoch, "The traveling salesman problem: a case study in local optimization", Local Search in Combinatorial Optimization, John Wiley and Sons, pp. 215-310, 1997. D. Gaertner: Natural Algorithms for Optimisation Problems", Final Year Project Report, June 20, 2004. L. L. Lai, J. T. Ma, R. Yokoma, M. Zhao, "Improved genetic algorithms for optimal power flow under both normal and contingent operation states", Electrical Power & Energy, System, Vol. 19, No. 5, pp. 287-292, 1997. J. Yuryevich, K. P. Wong, "Evolutionary Programming Based Optimal Power Flow Algorithm", IEEE Transaction on power Systems, Vol. 14, No. 4, November 1999. 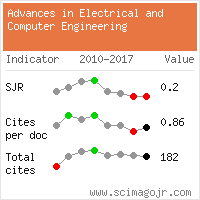 Citations for references updated on 2019-04-22 21:36 in 92 seconds. Website conception, design and maintenance by Eugen COCA. Content updated on 28 Feb 2019. Site engine updated on 28 Feb 2019. This page was generated on the server in 0.028 seconds and loaded in your browser in > seconds.